Erythropoietin is a hormone released by the human renal system (kidney) which increases the rate of production of red blood cells in response to falling levels of oxygen in the tissues and helps in the process of erythropoiesis (production of red blood cells). Erythropoietin stimulating agents (EPO) are used to treat people undergoing chemotherapy or treatments related to HIV. Globally, demand for Erythropoietin drugs (EPO) is driven by an increasing population with HIV, Cancer and Renal diseases. 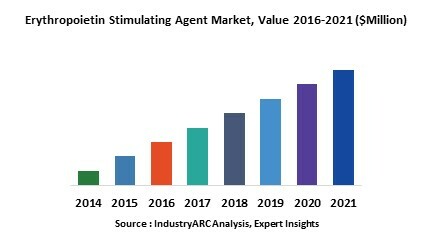 This report identifies the erythropoietin stimulating agents market size in for the year 2014-2016, and forecast of the same for year 2021. It also highlights the potential growth opportunities in the coming years, while also reviewing the market drivers, restraints, growth indicators, challenges, market dynamics, competitive landscape, and other key aspects with respect to erythropoietin stimulating agents market. Globally, North America dominated the market for erythropoietin stimulating agents in 2015 with higher awareness about erythropoietin drugs and higher cases of the renal, oncological and anaemic diseases. However by 2021, Europe, which closely followed North America as second largest regional market for erythropoietin stimulating agents is expected to overcome North America to dominate the global market. However, the Asia-Pacific market for erythropoietin stimulating agents is expected to post strong growth during the period of study due to increasing purchasing power, rapid development in infrastructure, growing medical tourism, and expansion in available treatments. This report on erythropoietin stimulating agents also covers different type erythropoietin stimulating agents, diseases cured and market size in various geographical regions. This report has been further segmented into major regions, which includes detailed analysis of each region such as North America, Europe, Asia-Pacific (APAC) and Rest of the World (RoW) covering all the major country level markets for erythropoietin stimulating agents in each of the region. 14.2. Teva Pharmaceutical Industries Ltd.
14.6. LG Life Sciences Ltd.